The Journal of the American Academy of Pediatrics brought play and recess to the forefront by issuing a major report in January on the importance of play in child development and then releasing a policy statement on the crucial role of recess in school at the end of the year. Nine-year old Caine Monroy proved that world-changing ideas come from everywhere – even cardboard boxes. As depicted in this short film that went viral last spring, Caine (pictured left) used leftover boxes from his father’s auto parts store in East Los Angeles to create his own arcade of games. In the process, Caine created a worldwide movement of imagination and inspiration, including the first-ever global Cardboard Challenge. With Imagination Playground™ in the background, First Lady Michelle Obama and U.S. Secretary of Health and Humana Services Kathleen Sebelius announced the next chapter of Let’s Move! Cities, Towns and Counties. The announcement focused on the development of five pillars for the program, including “Active Kids at Play.” Both the First Lady and Secretary Sebelius stressed the importance of play and physical activity, while addressing the need for communities across the country to assist KaBOOM! in creating a comprehensive map of playspaces. Children (and teachers) in Chicago public schools found out what they had been missing for nearly 30 years when they returned to school in the fall: recess! For the first time since the early 1980s, children in Chicago public schools were able to take a break from the classroom and share in laughter, joy and fun after recess was reinstituted. Washington D.C. Mayor Vincent Gray and the city council provided an example of what can be accomplished when elected officials unite for a common cause. Left with a sizable budget surplus in 2012, Mayor Gray and the city council committed to using the nearly $10 million surplus to renovate eight aging playgrounds. The decision proved so popular in the community that the Mayor and city council then allocated an additional $20 million in committing to renovate 32 playgrounds in the city by September of 2013 – the largest playground renovation project in DC history. I’ve been a teacher for 21 years. And through my work, I’ve seen the Play Deficit first hand. Since I began teaching, the number of hours kids spend outside playing has plummeted. Kids are spending more and more time behind TV and computer screens. And equipment like swings are being pulled from school playgrounds because they are considered "too dangerous." We can’t let the Play Deficit hurt our children. We must let them play. Play is crucial to healthy social, emotional, and cognitive development. Every day, I see kids learning important lessons on the playground. And I’m sure you can understand how grateful I am when they return to class calm and focused after running around with their friends. Please join me and other educators and help KaBOOM! fight the Play Deficit. Be a part of their Spring Donor Drive and your gift will be matched dollar for dollar by the A. L. Mailman Foundation. Build playgrounds in disadvantaged communities. Create an interactive map so they can identify cities where the Play Deficit is most rampant – and concentrate their efforts there. Ensure that at least one model playful city exists in each and every state. Their Playful City USA program provides grants to municipalities that offer innovative programs to get children active, playing, and healthy. Investing in children is investing in all our futures. Please help and let them play everyday. "I am fighting to save recess at our elementary schools and was referred to KaBOOM! as our fight got started. I have found valuable research and a supportive community at KaBOOM!. Our fight has progressed slowly but we haven’t given up, and when I feel the stress that comes from being outspoken in our community I find much renewed strength by visiting the online community at KaBOOM!." 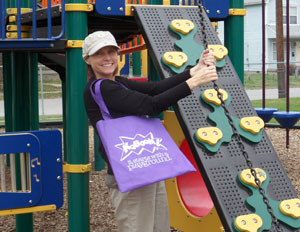 Play it forward to keep motivating play advocates like Sarah across the country.